This project engages in comparative research in order to learn more about causes, forms and nature of (extreme) violence by Dutch military forces in their attempt to re-establish colonial authority during the Indonesian struggle for independence (1945-1949). Extreme violence by Dutch security forces in the Indonesian archipelago has drawn a wave of scholarly and public attention in recent years. Similar processes have been taking place in France and the United Kingdom in relation to for instance torture, executions and mass deportation in colonial conflicts in Algeria, Malaysia and Kenya. To a lesser extent, the same is true for Indochina and the former Portuguese colonies. But research on the Dutch-Indonesian conflict (1945-1949) in the Netherlands has too long remained isolated, one might even say parochial. This has impeded our ability to fully understand the escalation of violence in this war. This research project therefore aims to compare the causes, forms and nature of the extreme use of violence applied in the age of decolonization. It supports the larger research program Independence, Decolonization, Violence and War in Indonesia, 1945-1950. Experts from two sides of the comparison will explore the question which factors were shared among the wars in various empires (such as legacies of racism and colonial violence, or the nature of irregular warfare), and which factors may have been unique to certain cases (such as leadership, international scrutiny, or the legacy of Japanese occupation in the cases of Indonesia and Indochina). Overall, the comparison will broaden and deepen our understanding of Dutch, French, British, and Portuguese patterns in decolonization violence and the nature of colonial warfare in general. The project is an intensive collaboration between the twelve international and Dutch scholars in a theme group that culminates in a three-month period at the Netherlands Institute for Advanced Study in Amsterdam (NIAS) in Spring 2019. For each comparative study, an international NIAS-fellow will work together with one Dutch expert on the decolonization war in Indonesia. The project’s findings will be presented during the conference organized by the theme group on 20-21 June 2019 in Amsterdam. The main papers will be published in a book by Cornell University Press in 2021. In June 2020 the leading historical journal BMGN-Low Countries Historical Review will also publish a forum in Dutch where the theme group members will present and discuss their findings. 2. 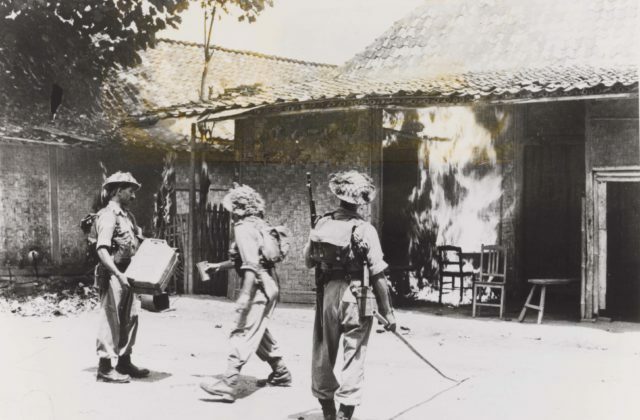 Bloody decolonization: Dutch and French responses to revolutionary violence in the Indonesian archipelago and Indochina, 1945-1946. 4. Sexual violence and gendered experiences of decolonization war in Indonesia and Algeria. 5. Communicating excessive violence: Political awareness and levels of responsibility in Indonesia, Malaya and Kenya compared. Dr Huw Bennett (Cardiff University) and Professor Peter Romijn (NIOD Institute for War, Holocaust and Genocide Studies). 6. Windows onto the micro-dynamics of insurgent and counter-insurgent violence: evidence from late colonial Southeast Asia and Africa compared. Professor Martin Thomas (University of Exeter) and Dr Roel Frakking (Royal Netherlands Institute of Southeast Asian and Caribbean Studies). The theme group “Comparing the wars of decolonization: Extreme violence during reoccupation and counter-insurgency, 1945-1975” is part of the large-scale research programme Independence, decolonization, violence and war in Indonesia, 1945-1950, carried out by the Royal Netherlands Institute of Southeast Asian and Caribbean Studies (KITLV), the Netherlands Institute of Military History (NIMH) and the NIOD Institute for War, Holocaust and Genocide Studies.